The Florida building where GDSI’s offices are located. 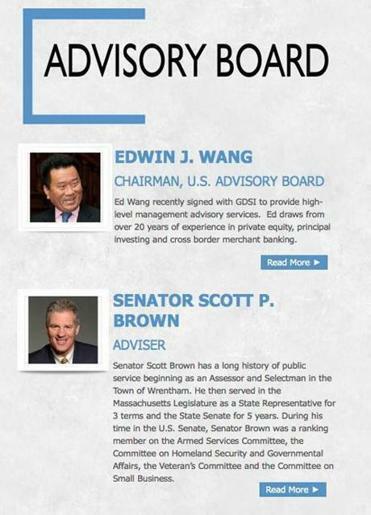 An obscure company in West Palm Beach that markets itself as a firearms manufacturer made a splashy announcement last summer: It was appointing Scott Brown, the former Massachusetts senator, to its advisory board. Not revealed at the time was what Brown received in exchange for lending his name to the venture. But a report the company made to the Securities and Exchange Commission last month, which has not been previously made public, shows that Brown received stock that was worth $1.3 million at the time. Its value has declined considerably since then, as the stock price has fallen by half. Global Digital Solutions Inc. does not yet sell or make guns. It has no revenue, no patents, no trademarks, no manufacturing facilities, and no experience developing weapons, according to its most recent corporate filings. It was founded as a beauty supply company in New Jersey — selling hair spray, conditioners, and shampoos, before reinventing itself as a wireless data firm from California and then again last year as a South Florida-based firearms maker and gun technology innovator. It is the kind of company, with scant assets and a shifting business model, that some financial professionals warn investors to steer away from. The company, instead of selling firearms, has churned out press releases to attract small investors, including the one about Brown joining the firm, and issued millions of shares of stock to fund its operations. Shares closed at 46 cents on the OTCQB Marketplace on Friday. During a brief encounter after a campaign event in Hopkinton, N.H., on Saturday, Brown declined to answer questions about his involvement with the company or the level of scrutiny he applied to its business methods before agreeing to associate himself with it. He referred to a campaign statement given to the Globe Friday. Accountants said in interviews that Global Digital’s filings raise a number of warning signs for investors, including its varying business model and lack of actual products. The firm reported it has four employees, $271,776 in cash and had $19.7 million in losses as of March 31. Barry R. Goldsmith, a former lead lawyer for the SEC and chief of enforcement for the National Association of Securities Dealers, said the company’s actions raise a number of issues “that I think a regulator would look at,” including its bold press releases and the company’s quick transitions in its business model. Now, as Brown tries to rejoin the US Senate — this time representing New Hampshire — new questions are emerging about what he has been doing to earn a living since he lost his Senate seat in Massachusetts 18 months ago and why he agreed to sign on with an obscure company in Florida. Brown has also worked as a Fox News commentator, lawyer, paid speaker, and as a member of a number of company boards since rejoining the private sector, but has yet to detail all his income sources. Brown took time away from the campaign trail last month to make a paid speech at a hedge fund conference in Las Vegas. He has yet to disclose what he was paid for the appearance, or for several other of his ventures since he left office in January 2013. Last month, Brown obtained permission to delay filing his financial disclosure form until August 9, one month before the Republican primary. The Democratic incumbent, Senator Jeanne Shaheen, filed her disclosure form on May 15. At least two of Brown’s Republican primary opponents have filed their disclosures. Brown has previously made his political opponents’ business activities a focus of his campaign rhetoric. During his reelection campaign in 2012, he pointed to Senator Elizabeth Warren’s legal work on behalf of an insurance company and other private clients in an attempt to undermine her credibility as a consumer advocate. “There is only one person in this debate, right now . . . who is protecting corporations. She has a history of it,” Brown said of Warren in a 2012 debate. Many congressional candidates and former officials have served on corporate boards. Brown’s involvement as “senior adviser’’ in Global Digital raises questions about the amount of work he is doing for the company in exchange for his large equity stake and the amount of attention he gave to the company’s practices before lending it his name and prestige. The company’s chief executive officer and president, Richard J. Sullivan, declined an interview request. But Sullivan provided a statement saying the company was attracted to Brown because of his experience in the military and on the Armed Services and Homeland Security committees in the Senate. Sullivan said the company issues press releases about possible acquisitions because it is required by regulators to disclose strategic plans. “The GDSI executive management team has a strong record of success in growing and acquiring fast-growing technology companies,” he added, directing further inquiries to the company website. Global Digital lists a prestigious address in West Palm Beach with a majestic view of the water and the Island of Palm Beach as its headquarters. The building directory lists another company at the suite: HQ Global Workplaces, which advertises that it provides clients with an address and access to furnished conference rooms as needed. 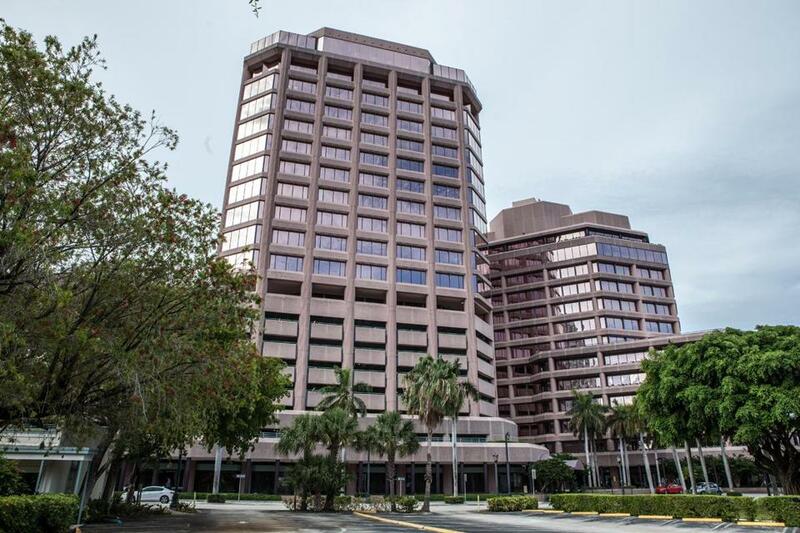 Global Digital reported in a securities filing that it signed a 12-month lease last year for a “virtual office” in West Palm Beach for $299 per month. Global Digital generated a wave of publicity after Brown agreed to join the advisory board Sept. 9. In exchange for his involvement, Brown received 1.5 million shares of company stock, worth about $1.3 million when they were granted, or about $690,000 at today’s prices, according to the company’s quarterly report filed on May 9. The shares were scheduled to vest between January and September of this year, allowing Brown to sell them. His picture is prominently featured on the company’s website as an adviser. The company’s stock price did not move from 88 cents a share on the day Brown’s appointment was announced, and it has declined by 48 percent in the months since. Brown’s campaign said he has yet to sell any of the stock. Brown is not the only high-profile politician the company has recruited to boost its profile. Global Digital announced in April 2013 that Jennifer Carroll had become a senior adviser, a month after she resigned as Florida’s lieutenant governor after investigators questioned her about her involvement in an Internet sweepstakes operation. In addition, more than a half-dozen penny stock newsletters reported they were paid by an investor relations firm to promote Global Digital in 2012 — when it was still focused on telecommunications — including $20,000 to ClubPennyStocks Network and $10,000 to PennyStockExplosion.com, according to OTC Dynamics Inc., a Winnipeg, Manitoba, firm that tracks penny stock promotions. To become publicly traded as an over-the-counter stock, so it could raise money from small investors, Global Digital merged in 2004 with a struggling cosmetics company called Creative Beauty Supply Inc. It has also drawn attention with announced plans for several major acquisitions that it never consummated. An announcement in March that it intended to buy Remington Arms Co. LLC, one of the world’s largest gun manufacturers, for more than $1 billion was greeted with derision by Remington and others in the industry, who dismissed it. Global Digital’s stock value is only about $45 million. “If this wasn’t disruptive to our employees and customers, we would not acknowledge the news and recognize it for what it is: a publicity stunt from an agenda-driven group with no credible financing options,” said George Kollitides, chief executive office of Remington’s parent company, in a memo to employees obtained by Outdoor Wire. Last year, the company announced it was buying a small bankrupt gun company, Airtronic USA, Inc. But that sale fizzled amid litigation, and Global Digital removed press releases about the merger from its website. It also announced it had signed a letter of intent to buy another tiny Florida firm, Cool Sound Industries Inc., saying its sound-wave technology had “potential for game-changing defense-related and commercial applications.” However, there is no indication in its securities filings that it completed the deal. The company said in a January press release that it would soon unveil digital technology to track and lock guns. So called “smart-gun” technology has been the subject of widespread interest in recent years after mass shootings. But Global Digital’s news release did not say how the technology works, when it will be available or how much it would cost. One of Brown’s fellow members of the advisory board, Richard J. Feldman, said he was asked to join at the end of April, a week after he called Sullivan to express interest. Feldman, who said he is a former gun lobbyist based in New Hampshire, said he had lunch with Sullivan and the chairman of the advisory board, but knows of no scheduled meetings with the full advisory board and has never seen the company’s office. Feldman said he did not know about the company’s history or much about its business plan, other than the expectation that it will use new technology and attempt to buy Remington. He said he has never met Brown. Correspondent Dan Moffett and Joshua Miller of the Globe staff contributed to this report. Bierman can be reached at noah.bierman@globe.com. Wallack can be reached at todd.wallack@globe.com.